Bruce William Boxleitner (born May 12, 1950) is an American actor, and science fiction and suspense writer. He is known for his leading roles in the television series How the West Was Won, Bring 'Em Back Alive, Scarecrow and Mrs. King (with Kate Jackson), and Babylon 5 (as John Sheridan in seasons 2–5, 1994–98). He is also known for his dual role as the characters Alan Bradley and Tron in the 1982 Walt Disney Pictures film Tron, a role which he reprised in the 2003 video game Tron 2.0, the 2006 Square-Enix/Disney crossover game Kingdom Hearts II, the 2010 film sequel, Tron: Legacy and the animated series Tron: Uprising. He co-starred in most of the Gambler films with Kenny Rogers, where his character provides comic relief. Boxleitner was born in Elgin, Illinois, the son of a certified public accountant. He attended Prospect High School in Mount Prospect, Illinois, and the Goodman Theater School of Drama of the Art Institute of Chicago (later renamed The Theatre School at DePaul University). 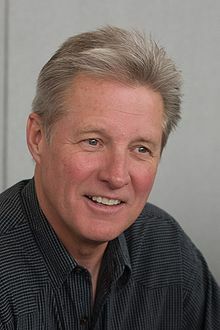 Boxleitner is best known for his leading roles in the television series How the West Was Won, Bring 'Em Back Alive, Scarecrow and Mrs. King (with Kate Jackson and Beverly Garland), and Babylon 5 (as John Sheridan in seasons 2–5, 1994–98). He also starred in The Gambler (as Billy Montana, alongside Kenny Rogers: 1980, 1983 and 1987) and in such TV movies as Judith Krantz's Till We Meet Again and Danielle Steel's Zoya. In 2005, he co-starred as Captain Martin Duvall in Young Blades. He has also starred in several films within the Babylon 5 universe, including Babylon 5: In the Beginning (TV, 1998), Babylon 5: Thirdspace (TV, 1998), Babylon 5: A Call to Arms (TV, 1999), and the direct-to-DVD Babylon 5: The Lost Tales (2007). He has appeared in many other TV shows, including an appearance in 1973 as Rick Welsh, a University of Minnesota Track Star, in the season four episode, "I Gave at the Office" in The Mary Tyler Moore Show. Other appearances include Gunsmoke, Tales from the Crypt, Touched by an Angel, The Outer Limits and She Spies, and in 1982, he played Chase Marshall in the TV film Bare Essence, with Genie Francis. He was a member of the cast of Heroes for seasons three and four, playing New York Governor Robert Malden in three episodes. He also appears on the television series Chuck as the father of Devon Woodcomb. He was in such made-for-television films as The Secret, Hope Ranch, Falling in Love with the Girl Next Door, Pandemic, Sharpshooter and Aces 'n Eights. Boxleitner was a guest-star on NCIS in the fall of 2010. He played Vice Admiral C. Clifford Chase, a high-ranking Navy official. Boxleitner also lends his voice to the animated version of his iconic character Tron in the animated series Tron: Uprising. The series premiered on Disney XD on June 7, 2012. He also reprises the character Alan Bradley/Tron from the films Tron and Tron: Legacy. From 2013-2015, he played Bob Beldon, the owner of the local bed and breakfast, in the Hallmark Channel series Cedar Cove. Boxleitner later recurred on Supergirl portraying Baker, the Vice-President of the United States who is later sworn in as the new President after Lynda Carter's character Olivia Marsdin is outed as a Durlan by Mercy Graves and Otis Graves. He gained the role after Brent Spiner stepped down due to a family emergency. Bruce Boxleitner at the 2010 San Diego Comic-Con in July 2010. He has also appeared in several films, including Tron (in which he played the title role) and The Baltimore Bullet (1980) with James Coburn. He reprised his role in the Tron sequel Tron: Legacy and in the video game Tron: Evolution which was released alongside the film Tron: Legacy, as he did for sequel video game named Tron 2.0, and Disney/Square Enix crossover video game Kingdom Hearts II. Boxleitner also voice as Col. John Konrad in video game Spec Ops: The Line. He also starred as Confederate General James Longstreet in the 2003 film Gods and Generals. He provides the voice of Colin Barrow in the animated science fiction horror film Dead Space: Downfall, based on the video game Dead Space. Other films he has been in include Kuffs, The Babe, Brilliant, Snakehead Terror, Legion of the Dead, King of the Lost World, Shadows in Paradise and Transmorphers: Fall of Man. In 2011, he officially announced that he will reprise his role as Alan Bradley/Tron in Tron 3. July 2015 Boxleitner said that he is done with the franchise, as "it's been too up and down for me. I would rather not just keep going. I don't want to repeat my career anymore." From 1986 to 1989, Boxleitner appeared in advertisements for Estee Lauder's "Lauder For Men". Boxleitner has written two science fiction novels with a Western setting, Frontier Earth (1999) and Searcher (2001). Boxleitner played a major role in the audio dramatization of The Great Secret, part of the Golden Age of Fiction series by L. Ron Hubbard. He also played Captain Gavin Blaire in the unabridged version of World War Z.
Boxleitner's first marriage (1977–1987) was to American actress Kathryn Holcomb, who co-starred with him on How The West Was Won. They had two sons together: Sam (born 1980) and Lee (born 1985). Holcomb went on to marry English actor Ian Ogilvy. Boxleitner's second marriage (1995–2011) was to American actress Melissa Gilbert. They had one son together: Michael (born 1995). Gilbert also guest-starred as Boxleitner's on-screen wife, Anna Sheridan, during Season 3 of Babylon 5. On March 1, 2011, Gilbert announced that she and Bruce had separated after 16 years of marriage. On August 25 of the same year the Associated Press reported that, based on court records, Gilbert had filed for divorce. On February 8, 2016, Boxleitner and his girlfriend of three years, publicist Verena King, announced their engagement. On October 5, 2016, they were married in Kapolei on the island of Oahu, Hawaii. He was friends with actress Beverly Garland for nearly 30 years. He met her on an episode of How The West Was Won, and later co-starred alongside her on Scarecrow & Mrs. King, though he had very few scenes with her. Then, in 1986, Boxleitner presented Garland the Golden Boot Award. After the cancellation of Scarecrow, Boxleitner remained close to Garland, contacting her consistently, until her death, on December 5, 2008. He said in an interview, "I used to keep up with Beverly Garland until she passed. There was actually a hotel named after her. She was such a trip. She was a great lady." ^ "Tron Legacy Star Bruce Boxleitner on the Rivalry Between Star Trek and Babylon 5". Archived from the original on March 17, 2010. Retrieved June 5, 2010. ^ "Bruce Boxleitner Biography". filmreference.com. Retrieved June 5, 2010. ^ "BRUCE BOXLEITNER as Captain John Sheridan - Babylon 5 GENUINE AUTOGRAPH". amazon.co.uk. Retrieved December 14, 2017. ^ "Exclusive: NCIS Enlists Scarecrow and Mrs. King's Bruce Boxleitner". TVGuide.com. Retrieved October 13, 2010. He reprised this role in the spring of 2017. ^ Ernie Estrella (June 9, 2015). "9 reasons more TRON Uprising is the answer to Disney's TRON sequel problem". blastr. Retrieved March 14, 2016. ...the Grid's security program, Tron (Bruce Boxleitner) is slowly dying from a virus. 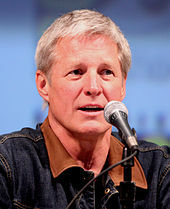 ^ "Bruce Boxleitner Added to Cast as Series Regular in Hallmark Channel's "Debbie Macomber's Cedar Cove"". The Futon Critic. May 20, 2013. ^ "Barbara Niven Added to Cast As Series Regular in Hallmark Channel's "Debbie Macomber's Cedar Cove"". The Futon Critic. May 29, 2013. ^ Topel, Fred (July 30, 2015). "Exclusive: Bruce Boxleitner on 'Tron 3′ – "I'm Done With It. I've Moved On"". Slashfilm. Retrieved August 4, 2015. ^ Boxleitner, Bruce (1999). Frontier Earth: HC. Ace Hardcover. ISBN 978-0-441-00589-5. ^ Boxleitner, Bruce (2001). Frontier Earth: Searcher. New York: Ace Books. ISBN 978-0-441-00799-8. ^ "Cover Story: Our Tiny Miracle – Vol. 45 No. 8". February 26, 1996. ^ "The-Complete-Babylon-5-Double-Autograph-DA1-Bruce-Boxleitner-and-Melissa-Gilbert The-Complete-Babylon-5-Double-Autograph-DA1-Bruce-Boxleitner-and-Melissa-Gilbert Have one to sell? Sell now The Complete Babylon 5 Double Autograph DA1 Bruce Boxleitner and Melissa Gilbert". ebay.com. Retrieved December 15, 2017. ^ Eng, Joyce. "Melissa Gilbert and Bruce Boxleitner Split". TVGuide. ^ "Actress Melissa Gilbert Files for Divorce in LA". New York Times. August 25, 2011. ^ "Michael Douglas and Catherine Zeta-Jones put on the PDA at AARP Awards | Daily Mail Online". dailymail.co.uk. Retrieved February 10, 2016. ^ "NEWS RELEASE: ACTOR BRUCE BOXLEITNER APPOINTED TO NATIONAL SPACE SOCIETY BOARD OF GOVERNORS". nss.org. June 2, 1998. Retrieved December 15, 2017. ^ "Bruce Boxleitner interview". lanterncitytv.com. Retrieved February 8, 2016. Wikimedia Commons has media related to Bruce Boxleitner.